This was a reread for me, so I knew exactly what I was in for — a long book, with digressions and ramblings. A book that echoes, pastiches, draws on the tradition of an older sort of novel, establishing a narrative of literature and scholarship around itself with its footnotes and references. A book of magic, and fallible people, and old enchantment. It’s a novel other people have found badly paced, slow, boring, full of unlikeable characters, unbearable, etc. Obviously, because this was a reread, I didn’t find the pacing terrible or the characters so unlikeable as to ruin it; in fact, now I’ve finished it, I could almost be tempted to begin again right now. I love this book even more than I did the first time I read it. Clarke creates a wonderfully rich world, full of people who act like people — self-interested; lazy; careless; fearful; brave; heroic; clever… It strikes me that it’s easier to list dozens of ways you can be less than ideal than it is to come up with dozens of ways to be ideal, so perhaps there’s some truth in saying that this book is heavy on the less-than-ideal characters. Which is fine, by my lights, because so is life. If you spend time in the world, you see all the major characters doing things both good and bad, making sins of commission and omission, quarrelling and loving. I find it an incredibly rich world, and I was sorry to be finished. I want to know what Strange and Norrell study, what Childermass does, whether Arabella ever sees Strange again, what the new King is like… I love the way it uses some of our legends and stories about magic and fairies, but adds to them and draws them together. I loved that it was a really solid read, something I could lose myself in. I love reading all the time, but I especially love it when a book opens a new world to me instead of just letting me observe that world, and that’s how I feel about Jonathan Strange & Mr Norrell. I could feel while reading as though if I turned and looked at a mirror, it might be a door leading to who-knows-where — and while under Clarke’s spell, I’d take that door in a heartbeat. I think Norrell loves Strange. 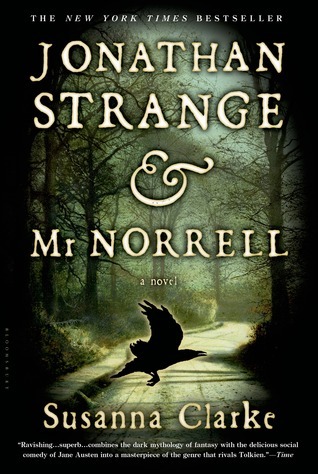 It’s complex, jealous, but nonetheless I think Norrell would be less without Strange, and knows it. I have to make time for a re-read of this book! I loved it when I first read it so many years ago — and now, watching the TV production, I realize how many details I’ve forgotten. It is really great. I need to see the BBC series now! Do see the BBC series, either as a set or on catch-up — it’s inspired me to read it, something I was reluctant to do before the series ended. Great acting and good production values, and I guess it must have captured that period literary tradition that you rate from your review (not to forget the coincidental historical timing of the bicentenary of Waterloo and the Napoleonic wars). Sorry – but this book is interminably dull. Not only do you need a book-stand to hold it for you, but it is a heavy read anyway. It could be so much more, but for the pseudo-academic way in which the story is narrated, rather than being told. I’m only half way through and so far have read 5 other books as fill-ins for a rest from the drabness of this tome. Only virtue is as a book-end on a shelf or a good door-stop! I don’t know why you’re apologising to me! Tastes differ, and that’s fine. I loved it, as the review you commented on shows. My wife, for instance, didn’t.